/ What is a Softshell Jacket? Softshell jackets fill a much-needed void between lightweight insulating pieces and waterproof hardshells. They stretch for movement and breathe well, yet still offer better protection from the elements than a standard fleece or synthetic jacket. Below we break down what characteristics define a softshell, from their woven construction to the amount of weather resistance to expect. Softshells often are misunderstood as being warm, insulating pieces (at most they offer modest warmth) or fully waterproof (they’re usually not), so we’ve detailed the major considerations in this article. One final bit of advice before we dive in: don’t be deterred by what softshells are “not.” Their balanced design makes them a go-to jacket for a wide range of activities all year round. First and foremost, softshell jackets are intended for high-output activities where you’re working hard. They are made with woven nylon or polyester that is stretchy, highly breathable, and decently weather resistant. These characteristics make them ideal for climbing, biking, backcountry skiing, cross-country skiing, hiking, and the list goes on. Essentially, if it’s cool outside, not too wet, and you’re working hard, a softshell is a terrific outerlayer. The jackets allow enough air in and out to regulate your body heat, giving them a significant leg up on the other two shell options: hardshell jackets and rain jackets. But they offer more protection from the elements than a standard insulating midlayers like fleeces, synthetic jackets, or down jackets. Falling in that middle ground makes them a highly versatile piece that is usable in all four seasons. Most softshell jackets offer decent water resistance that can keep you dry in light to moderate precipitation. 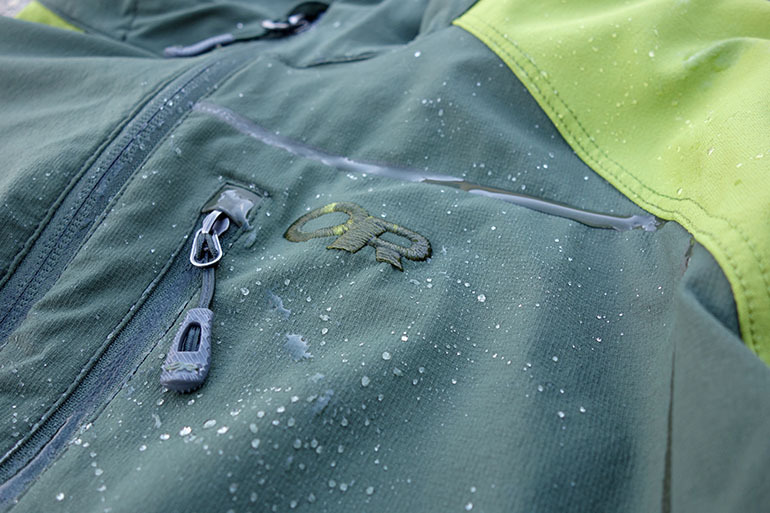 It starts with a durable water repellent (DWR) coating on the exterior, which beads up and sheds raindrops, and the jacket’s hard-faced shell does a good job keeping moisture at bay. Softshells usually are not waterproof, however, and sustained rainfall will absorb and eventually soak through the woven fabric. This is one of the primary compromises in a softshell, but it doesn’t deter us from bringing it along on most outdoor adventures, and you can always bring along a packable rain shell as backup. Recently, outdoor gear manufacturers have modified the construction of some softshell jackets to include a waterproof and breathable membrane just like a rain jacket. Traditional softshells were either one layer of woven fabric or two (a hard-faced outer bonded to an interior fleece lining), but it’s relatively simple to add a waterproof membrane in-between the layers. Combined with seam taping and the DWR coating, you get a jacket that is nearly as waterproof as a hardshell but still retains the stretchiness of a softshell. Waterproof softshells are still a bit of a rarity but examples include the Patagonia Kniferidge, Outdoor Research Mithril, and Marmot Zion. The downside is that extra waterproof layer inhibits breathability. 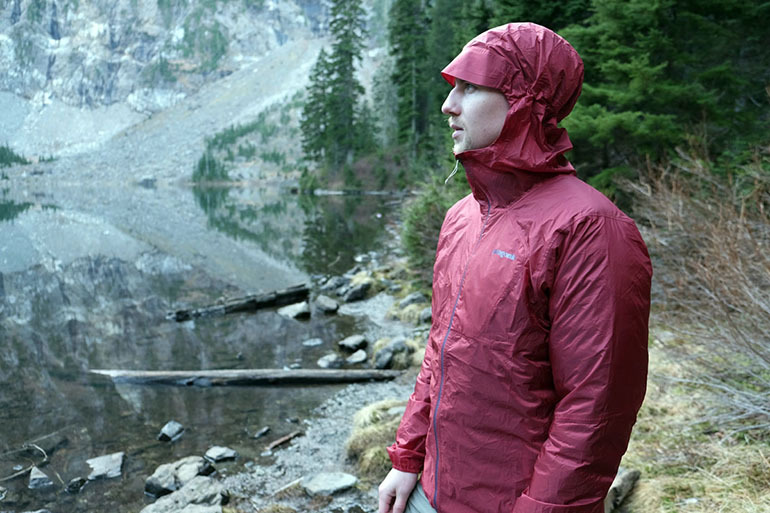 The smooth face fabric on a softshell typically is wind resistant but still porous enough to allow some airflow. It’s enough where you may not feel a light breeze, but a strong gust definitely will be noticeable. This partial wind resistance is intentional because it allows you to stay cool when you’re working hard. There are, however, softshell jackets and pants that are either fully or partially windproof. Gore’s Windstopper—the same company that makes Gore-Tex waterproof products—is the most common design. A wind-blocking layer is sandwiched in-between the outer layer and inner liner. Just like with a Gore-Tex softshell, breathability is compromised but jackets with strategically placed panels of Windstopper (or comparable) fabrics, including the Marmot ROM jacket, do a good job balancing windproofing while keeping you comfortable. 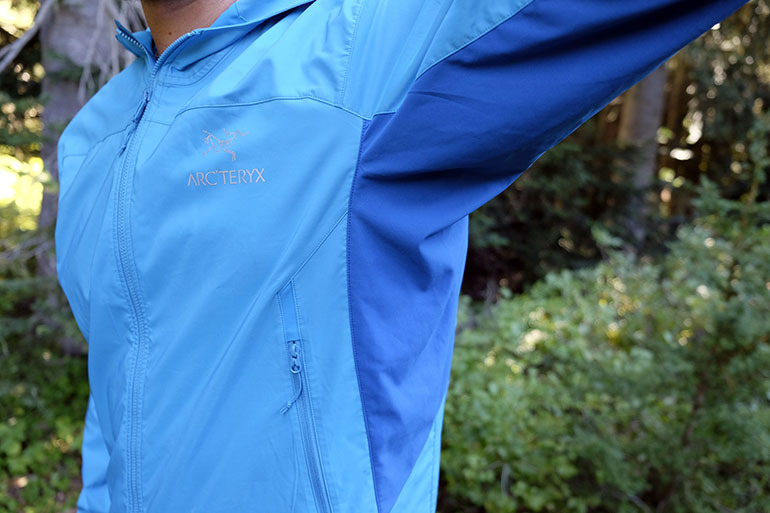 Along with breathability, our favorite softshell characteristic is the stretchy feel. In stark contrast to a rigid hardshell, you get fantastic mobility in a softshell—and none of the loud crinkly noises as you move—that’s beneficial both as a performance piece or everyday jacket. You can also select a softshell with a slightly snugger fit due to its forgiving nature. And their stretchiness makes them popular for climbing, scrambling while hiking or mountaineering, and backcountry skiing where you’ll be reaching, bending, and otherwise contorting your body. The outer fabrics of performance softshells will have 4-way stretch (they stretch horizontally and vertically) for fantastic range of motion. If you see a jacket referred to as 2-way stretch, that means it only stretches either side to side or up and down, and not both. The amount of warmth will vary based on the thickness and construction of the jacket, but softshells offer more insulation than a rain jacket or hardshell. While rain jackets and hardshells are just that—thin shells designed to keep moisture out—a softshell is thicker and often includes a light interior lining. The warmest softshell jackets bond fleece to the inside of the jacket, offering almost as much warmth as a thin fleece jacket or synthetic jacket. The boost in warmth over a hardshell is nice if you want to only wear a baselayer beneath in cool temperatures. However, because some softshells are very air permeable, they may not retain as much heat as a completely waterproof jacket. 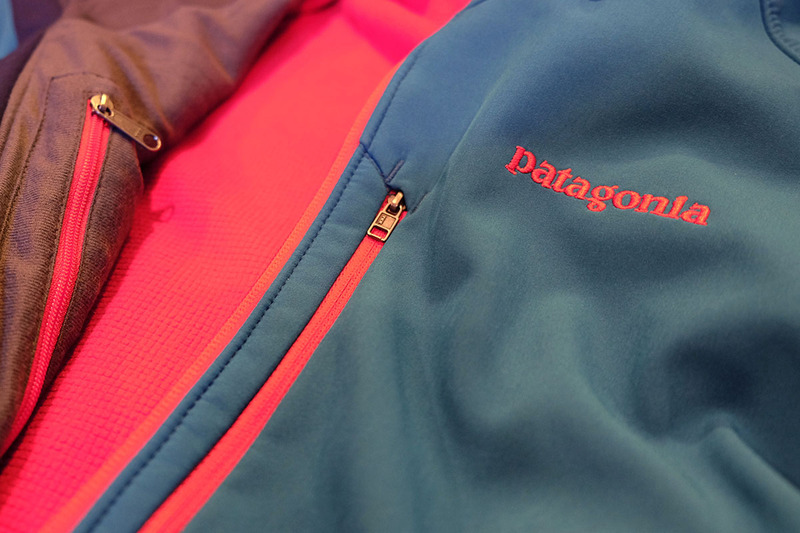 This is where a rain jacket or hardshell’s lack of breathability can come into play. If you’re working hard in a hardshell, you may actually get warmer (and often too warm) than doing the same activity in a softshell. But for pure insulation, a softshell still is the warmest outerlayer. With a thick construction, softshell jackets are the heaviest of the 3 outerlayer options. Rain jackets can weigh as little as 5 ounces, and just about every major outdoor gear manufacturer makes a waterproof shell that weighs less than 10 ounces. And while hardshells are usually a little heavier, it’s not uncommon to find them at less than 10 ounces (including the 8-ounce Patagonia M10). Softshells, on the other hand, are significantly heavier. From our recent softshell review, only 2 jackets—the Outdoor Research Ferrosi and Arc’teryx Tenquille—weigh less than 1 pound. This can become an issue for activities when weight is important, like backpacking, but if you’ll be done in a day, the extra ounces probably won’t make much of a difference. 7. 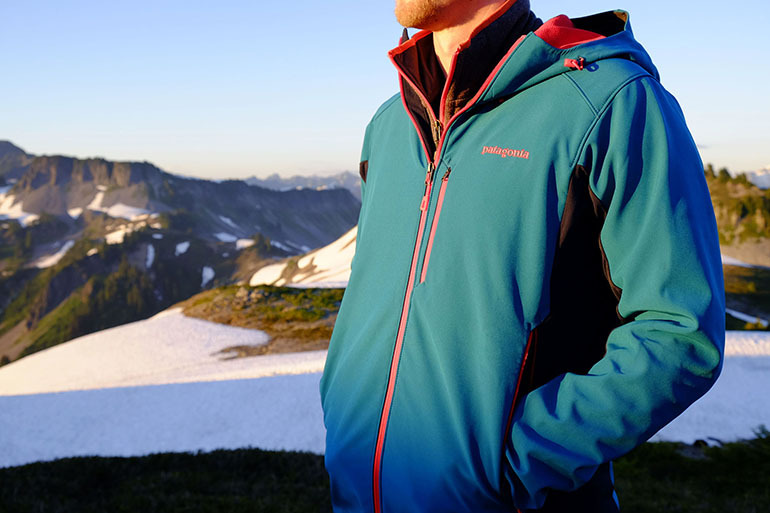 What Types of Outdoor Apparel Use Softshell Tech? As we’ve touched on above, softshells are great for a wide range of outdoor activities where you’re likely to work up a good sweat. The most common type of softshell is a pant or jacket used as an outerlayer for climbing, backcountry skiing in mild conditions, biking, and plenty of other cool weather sports. Softshell materials are also commonly found in hiking pants, too. Their stretchiness, breathability, and decent weather resistance work well in anything from a spring hike to peak bagging in the summer months. Not all products use softshell fabrics exclusively. In fact, there are a lot of jackets and pants on the market that are considered hybrid softshell/hardshell designs. Hardshell panels are used in areas most prone to moisture, such as the shoulders, arms, or lower legs, while softshell panels are inserted under the arms and along the upper legs for stretch and ventilation. A well-executed hybrid design like the Arc’teryx Alpha Comp jacket for alpine climbing or Patagonia Reconnaissance pants (see our in-depth review) for backcountry skiing can offer a great balance of protection and mobility. One really nice use for a softshell jacket doesn’t involve rock climbing or backcountry skiing as we’ve discussed above. Because of the water and wind resistance, they make great fall and spring daily pieces for simple activities like walking your dog and taking your daily stroll around the neighborhood. There are many times when it’s chilly, a bit windy, or drizzling, but you don’t want to carry a separate rain jacket with you just in case. At the same, your sweatshirt or fleece will soak up water pretty quickly and won’t block the wind. So if you have room in your closet, we bet you’ll get more everyday wear out of a softshell than you might expect. They are great all-in-one pieces for the shoulder seasons, and of course, the extra weight doesn’t matter much for these types of uses. Softshells are among the most versatile pieces of outdoor apparel, but they do have their limitations. The most obvious instance is when the weather is severe. The air permeable construction is a detriment in high winds, particularly if you’ll be stopped and hunkered down for an extended period of time. And the same goes for rain downpours: softshell jackets just can’t compete with the waterproofing of a rain jacket. Weight is another important consideration, and for those that put a premium on going ultralight (backpackers come to mind), a softshell may not be your ideal outerlayer. Softshell jackets will weigh more than a rain jacket and still not give you complete waterproof protection, so you’d then have to bring two outerlayers. Outside of these specific scenarios, softshells are fantastic. We’ve found ourselves reaching for our favorites in more and more instances as we’ve become comfortable with their abilities. For more on softshells and to see which models we recommend, check out our article on the best softshell jackets.